Hosting the Golden Globes has to be a difficult job. After all, it’s not The Oscars, and nobody really pays that much attention to the award. 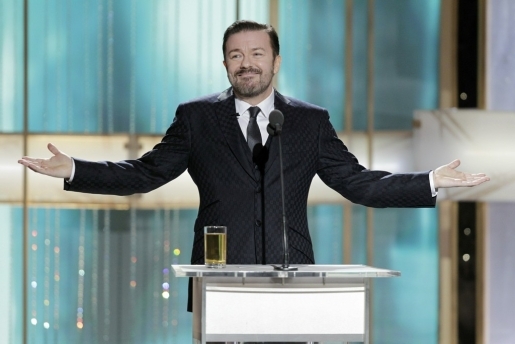 However, new host Ricky Gervais (back for the second year) is making the Golden Globes must-see television thanks solely to his fearlessness and his willingness to go after every celebrity he introduces, every celebrity in the audience, and basically anyone in his path. This is a brave, crazy man making jokes about Scientology in a room full of humorless Scientologists. It’s fearless and brilliant. Also, they give out awards. See the complete list of Golden Globe winners at the Washington Post. That is to say, in a year dominated by Glee on the TV side, there weren’t interesting, well-deserved winners otherwise. Namely best actor in a comedy Jim Parsons (for Sheldon Cooper on The Big Bang Theory) and best actress in a drama Katey Sagal (for Gemma Teller Morrow on Sons of Anarchy). The movie awards were mostly exactly how I’d have wanted them to go down, with Natalie Portman winning for Black Swan and The Social Network‘s team of David Fincher and Aaron Sorkin cleaning up everything else.